Are you looking for a squirrel cage filament? 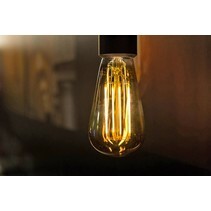 Look at this squirrel cage LED filament dimmable 4W! This LED bulb light has a nice filament effect! 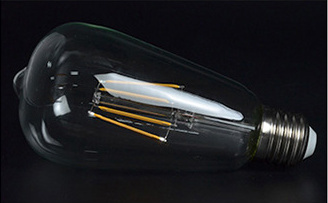 Does this squirrel cage LED filament dimmable 4W fit with your lighting fixture? Continue reading then. 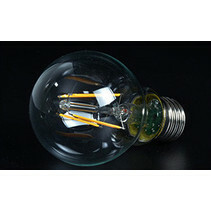 This squirrel cage LED filament dimmable 4W is a real beauty! Due to its warm light color temperature and its long-shaped form, it fits perfectly with rural lighting. The sphere it creates is warm and unique. It's a real vintage lamp and it really reminds you at the nostalgic lamp of Edison. 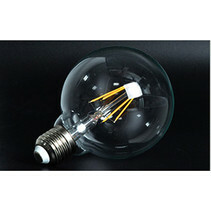 This squirrel cage LED filament dimmable 4W is a very good replacement of your incandescent transparant bulb lights. The effect of this long filament light is the same of the one of a halogen lamp of 28W. So, this only consumes 1/7 of the halogen lamp. The advantage of this squirrel cage LED filament dimmable 4W is also that due to the low consumption, you don't have to worry about a too high electricity bill. See more information about the saving of energy. Standard, the fitting is E27. 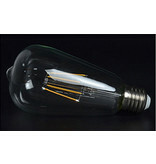 This squirrel cage filament LED 4W is available in warm white (2700 Kelvin). In addition that this squirrel cage LED filament dimmable 4W is useful for your lighting fixture, we guarantee a good after sales service. You will be informed about the status of your order. After payment, we treat your order. Once that the squirrel cage LED filament dimmable 4W is in stock, we will inform you about your order. Do you have more questions? Contact us by phone (+32) 57 466 866 or by mail (info@myplanetled.com) in order to obtain more information about this squirrel cage LED filament dimmable 4W.